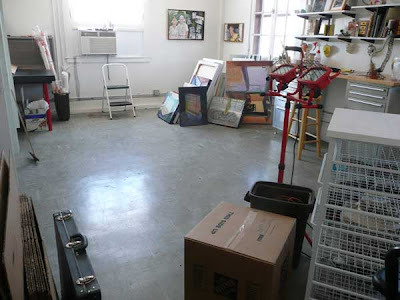 It seems like just yesterday that I was hauling boxes and boxes of art materials upstairs into my new studio space. 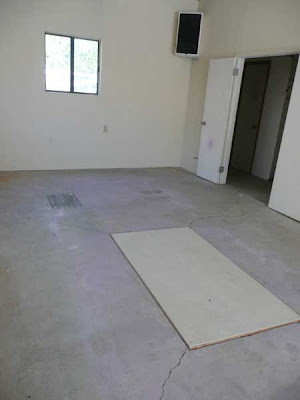 It was quite a leap for me, having never had a studio that wasn't a former bedroom or dining room in our living space. Now, here I am packed up, ready to move on. Here's Jim, moving fast. 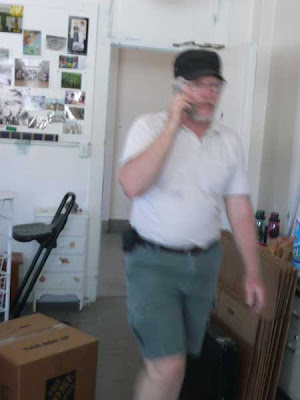 He is always my hero, but particularly today, when he hauled numerous heavy boxes, not to mention heavier furniture down the stairs for me. Our new home has an oversize, end to end garage with a high ceiling. It came equipped with a lube pit. Didn't need a 6' deep hole in my studio, so Jim covered it with cement board. It's quite sturdy, and I don't feel the least bit like I'm going to fall in. 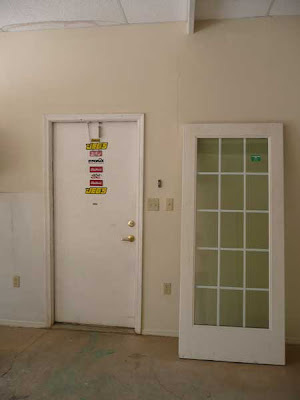 This new (actually it's used) glass door will be replacing the solid door (hopefully tomorrow). Here is the garage door opening. 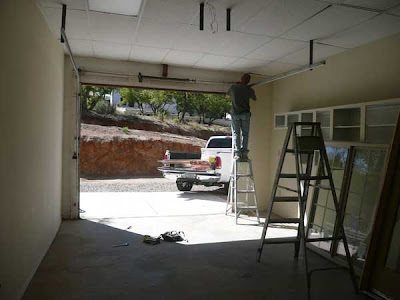 Mike, our intrepid worker, has removed the ugly garage door and is getting ready to install a big window and glass door. More photos tomorrow, when he's finished his part of turning the garage into my own almost 600 square foot studio space. Then it will be up to me to seal the floor, finish painting the interior, and most importantly, get to work! Well, you'll just have to come down for a visit. It's not all that far. It's also about 20 degrees cooler than Phoenix!